I know what you are thinking.. “What in the heck does Junior Brown have to do with cobbler?” Well, nothing I could likely prove in court BUT the other night there was lots of talk of pies, grunts, cobblers, sonkers, and who all knows what else. So I decided to make a blueberry cobbler and I like to cook to music.. I threw on some Junior Brown. Fact is, that gooey, delicious fruit confection pairs well with the sweet sweetness that is Mr. Brown on his guit steel. Before I go any further, I need to ask-Have you ever had your face melted, like so much sweet cream butter, by the awesome power of rock n’ roll? 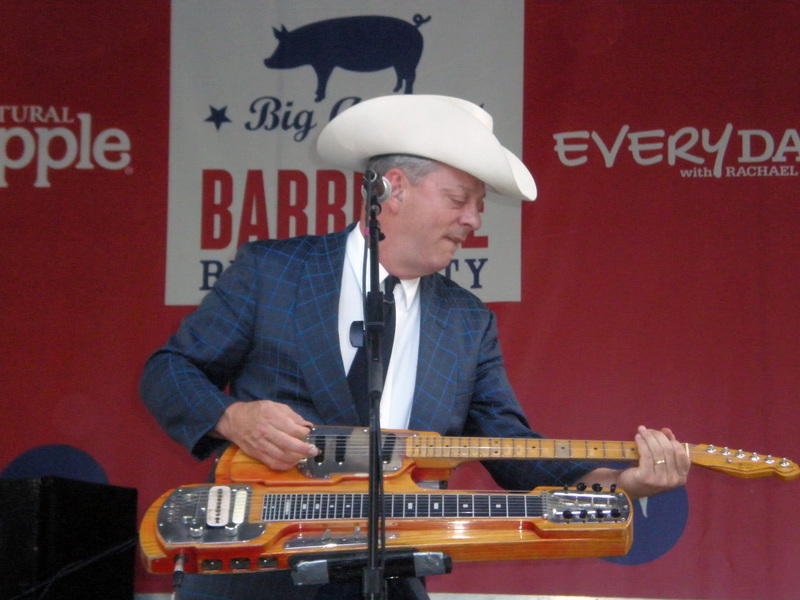 Junior Brown brings it like nothin’ you have ever seen or heard. He is based in classic country but he often works blues, surf, honky tonk and straight up rock and roll riffs into his playing. The man created his own damn instrument! He loved the twang of the steel guitar and the shred of a standard guitar and was unwilling to choose just one. So he had one custom made and he plays it like a demon. That is some renegade style right there. I remember the GAP ran a series of hip ads in the late 90s. One featured Junior and his wife Tanya. Tanya Rae Brown plays rhythm in his band and she is no slouch, she also sings. If you’d like to acquaint yourself with the human barnburner that is Mr. Junior Brown, may I suggest this link. If you’d like make the easiest fruit cobbler to go with those juicy licks, how about this recipe given to me by the most gifted fruit wrangler, April McGregor who got it from someone else who no doubt got it from another baker…etc..etc…infinity. 1 stick of butter in the baking pan in the oven while it preheats to 350degrees F.
Mix a cup of flour, 2 tsp baking powder, and a cup of sugar. When the oven is preheated and the butter is melted, add a cup of milk to the flour mix. Stir well and pour into the hot butter. Top with 4 cups of fresh fruit and their juices and bake for about an hour. Damn straight, Junior!!! If Junior Brown is playing in your town, RUN DON’T WALK!!!!! This entry was posted in Uncategorized and tagged April McGregor, barnburner, blueberry cobbler, Farmer's Daughter, guit steel, Juinor Brown, Tanya Rae Brown. Bookmark the permalink.